Gross motor skills are those used to move your arms, legs, and torso in a functional manner. Gross motor skills involve the large muscles of the body that enable such functions as walking, jumping, kicking, sitting upright, lifting, and throwing a ball. Acquiring motor skills is an important part of child development that allows children to participate in activities and achieve age-appropriate developmental milestones. Gross motor skills also require motor planning—that is, the ability to think through and act upon a plan for motion. A child with poor motor planning abilities may have the strength and muscle tone to climb the ladder of a slide, for example, but may not be able to do so because of an inability to place his feet in the right spots and in the right order to reach the top. Gross motor skills are distinguished from fine motor skills—​the ability to use hands and feet for complex, small muscle activities. So, for example, while gross motor skills involve running and jumping, fine motor skills are used for such activities as writing and drawing. While these sets of skills may appear similar, they are actually controlled by different parts of the brain. If you have just one child, and that child has developed at least some gross motor skills, it can be tricky to determine whether he is meeting the full set of developmental guidelines. Perhaps surprisingly, very young children should be able to manage rather complex gross motor tasks. It is important to remember that all children develop at different rates. Developmental guidelines provide a general idea of the age at which children acquire these skills and in what order. Just as with other skills, there may be considerable individual differences when it comes to gross motor skill development. Some kids may hit these milestones quite early, while others may not achieve them until later. It is possible that your child may be behind the targets listed above because he simply needs more time to catch up. But it's also possible that gross motor skill delays could be due to a physical concern. For example, low muscle tone (hypotonia) is a characteristic of Down syndrome, as well as, muscle, and central nervous system disorders, among other things. If your child seems to be struggling with some of these skills, it could be a sign of a problem that requires intervention and treatment. Talk about your concerns with your doctor if you believe there might be a physical problem interfering with your child's gross motor skill development. If your child seems to be far behind her peers, a conversation with your pediatrician is a good idea. Your physician will monitor your child's gross motor development during regular checkups to ensure that he or she is meeting developmental milestones. However, you should be sure to contact your doctor immediately if you notice changes in your child's ability to perform movements or skills that they used to be able to do. Parents and teachers may very well be the first to notice problems as they observe a child's actions every day. Evaluation by a pediatrician, as well as a physical therapist or occupational therapist, can determine how severe the problem is and begin the process of establishing a helpful course of therapy to improve your child's gross motor skills. The treatment that's recommended will depend on the type, severity, and nature of the delay. In some cases, gross motor skill delays may not require specific intervention and will resolve as the child continues to grow. In other cases, your doctor may recommend home exercises or physical therapy to improve strength, muscle tone, coordination, balance, and body control. For children in academic settings who have an Individualized Education Program (IEP), an IEP team will use therapists' assessments and other evaluation data to determine if your child needs regular therapy as a related service. If your child needs therapy to benefit from specially designed instruction, these services will be written into the individual education program. Gross motor skills play an important part in a child's development, and these abilities tend to build upon each other progressively. Learning to walk, for example, then allows children to develop more advanced skills such as running and jumping. 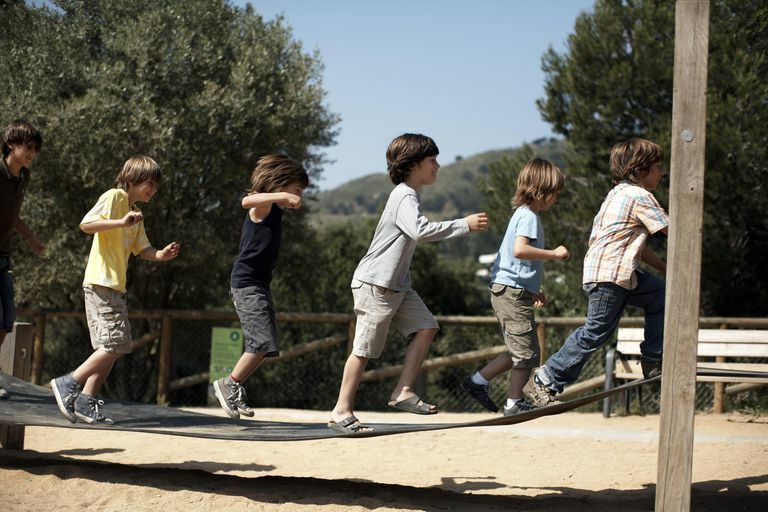 There are a number of reasons why gross motor skills are so critical to child development and why it is so important to address delays as early as possible. Gross motor skills are important for major body movement such as walking, maintaining balance, coordination, and reaching. These abilities share connections with other physical functions. Such skills are important for play, sports, and fitness. They are also connected to other actions necessary for daily living and academic success. Everyday functions such as walking and playing, as well as vital self-care skills such as getting out of bed and climbing stairs, are dependent upon these gross motor skills. Delays in gross motor skills can also lead to problems with fine motor abilities. A student's ability to maintain upper body support, for example, will affect his ability to write. Writing is a fine motor skill, but many aspects of it hinge on gross motor movements. Students with poor gross motor development may have difficulty with activities such as writing, sitting up in an alert position, sitting erect to watch classroom activity, and writing on a blackboard. Early intervention is also important because gross motor development may have an impact on a child's cognitive and motor abilities as they grow older. In one study looking at children with learning disabilities, researchers found poor gross motor skills were linked to learning lags, including problems with reading and math. Children grow and develop in stages and you should learn about child development and how motor skills develop from infancy through elementary school years. Monitoring the development of these gross motor skills is a good way to determine if your child is on track, but it is also important to remember that all kids develop at different rates. Some children might achieve a milestone such as walking by nine months of age, while others may several months past their first birthday before they achieve this milestone. If you do suspect that your child may have a delay in gross motor development, discuss your concerns with your child's pediatrician. Piek, JP, Dawson, L. Smith, LM, & Gasson, N. The role of early fine and gross motor development on later motor and cognitive ability. Human Movement Science. 2008;27(8):668-681. doi:10.1016/j.humov.2007.11.002. Westendorp, M, Hartman, E, Houwen, S, Smith, J, & Visscher, C. The relationship between gross motor skills and academic achievement in children with learning disabilities. Research in Developmental Disabilities. 2011;32(6):2773-2779. doi:10.1016/j.ridd.2011.05.032.